Striking academic workers at York University have sent a clear message to their employer by overwhelmingly rejecting a contract offer they were forced to vote on. All three striking units of CUPE 3903, representing teaching assistants, contract faculty and graduate assistants who collectively perform more than half of the instruction at York University, resoundingly turned down their employer’s offer, which York had demanded be put to a ratification vote supervised by the Ontario Labour Relations Board (OLRB). “The ball is now squarely in York University’s court. For six weeks, the University has dragged its feet, engaged in needless finger-pointing and a host of other things that haven’t addressed the outstanding issues between the parties,” said CUPE 3903 Chairperson Devin Lefebvre. “If York devoted a fraction of the attention they’ve spent on spinning public relations and high-priced legal counsel to sitting down and actually negotiating with their employees, we very likely would have resolved this dispute weeks ago,” he added. Today’s announcement follows a weekend of online voting by members of CUPE 3903 Units 1, 2 and 3. A week earlier, York had requested an OLRB-supervised ‘final offer’ vote. 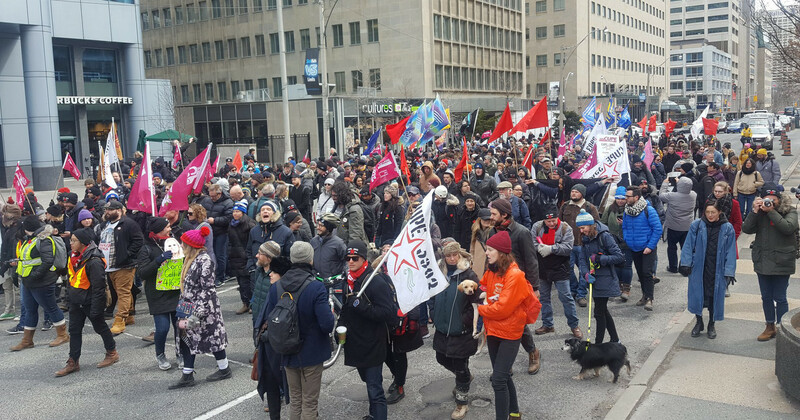 Hundreds of CUPE 3903 members and their supporters assembled in front of the Provincial Ministry of Labour’s offices on University Avenue this afternoon for a raucous rally, marching north to Queen’s Park. “Your government can continue to draw false equivalences, calling for both sides to return to the table, or you can see the forest for the trees and call on York to get serious about ending this strike,” said Lefebvre. CUPE 3903 remains ready and available to resume bargaining at a moment’s notice. “The only piece missing from this puzzle has been York University. We cannot negotiate with empty chairs, and I sincerely hope that Premier Wynne and Minister Hunter recognize that today’s results demonstrate our members’ resolve and take whatever steps they can to get York University to sit down and finish the job of negotiating a fair contract with their workers,” said Lefebvre.